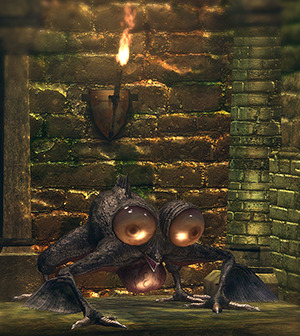 These frog-like creatures jump around and spit gas that can result in a curse status ailment if you are exposed long enough. Fog spewing - They fill up their lungs and spit out fog that will get you cursed if you stay inside it. But this is a slow animation and can easily be avoided. Just wait and get behind it. Jump and spew - They jump at you and spew fog in your direction. Jumping attack - They'll jump from a distance and drop down. There are ten in total in the lower sewers levels. 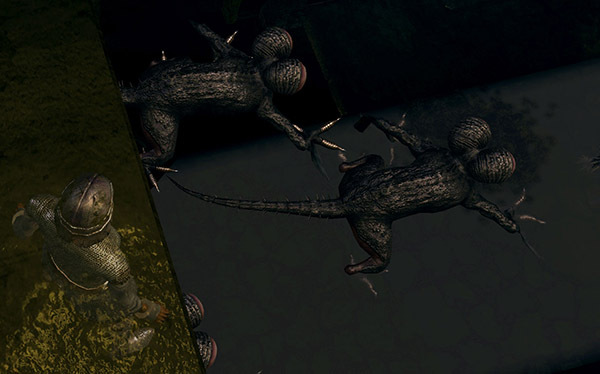 They're encountered when you fall down through a trap on the ground (a hole, so watch your steps; you should be warned that a rat will try to lure you through one of those traps by standing on it). When you fall, you will be attacked by a group of those handsome devils, and they'll sneeze on you like it's winter in a frozen hell. Forget the shield, dual wield your weapon and deal with them carefully but quickly (they rarely use physical attacks). Alternatively go straight down the stairs from the bonfire. Down the ladder to your left, and down the stairs at the end of the hall. Take an immediate left and into the tunnel with 3 large rats, and 1 small rat. Around the corner is the first Basilisk, and the other nine are ahead of you from there. This particular run is an easy way to farm for Eyes of Death and humanity. Be aware that a much more bothersome kind of these monsters can be found in the Great Hollow (area accessible through the base of Blighttown). They are more resistant than their counterpart and should preferably be confronted one on one. Another way to avoid being killed by Curse is to acquire curse resistance. Getting the Cursebite Ring from New Londo Ruins gives enough resistance to survive several simultaneous curse bursts. Curse resistance is also granted for every point of humanity showing on status screen. The Paladin Set also has high curse-resistance, further increasing your chances of surviving. Consuming your spare humanity fragments or hunting more down may give you a little leeway with mistakes. Having a few Purging Stones on hand before you attack the frogs is advised. Killing these guys gives you a relatively large number of souls for an easy kill. Therefore, they are great for farming. They have very little HP and are easy to dispatch. If you can find a route to approach some from behind, it is recommended to do so because they will not notice you regardless of how much noise you make. The basilisks will only engage you if you enter their line of sight. Do not get caught in the cloud of gas, as it will cause curse build-up. Basilisks are easy to kill at range with one firebomb. Firebombs from the Undead Merchant Male cost 50 souls a piece and each frog yields 200 souls in return. The frogs burn really quickly and die even if not hit directly, as firebombs have a nice Area of Effect. The player will require about 30-40 to comfortably pass through depths without much worry, and a nice haul of souls in return. The Drake Sword can be quite effective with its two-handed shockwave (Heavy) attack. A long thrusting weapon like the winged spear or the halberd can be quite effective at reaching the frogs when they're in a curse cloud. If you have the Set of Thorns armor you can roll into a basilisk that is about to breathe and it will be stunned long enough for you to get a blow or two in. They are really easy to kill with the fireball spell, especially the five in the depths, which are located in a pit. These frogs are below you, so it is possible to just drop a fireball on their heads. However, don't forget to run when they jump.